Looking upon the Neopian Calendar, there are many events shown in plain black writing, then there's a particular entry in purple and green, for the most spectacular of faeries – Jhudora. It is time we celebrate our love for Jhudora, for February 4th holds a day of great evil, witchery and wicked spells! Everyone waits for this day with such eagerness, but most people have no idea how to celebrate in a Jhudora-y way. How about we have a look through all of Jhudora's favourite items, to help you decide what you might play around with (or perhaps stay away from) on February 4th of 2012? Illusen Faerie Doll: You were thinking, "But why would Jhudora have a doll in the shape of her worst enemy?" Of course, she uses it for revenge! Attached to the doll in Jhudora's Glade is a string with which she can drag the doll around- through dirt, mud, snow... through Moltara (ouch, hot!). Every time Jhudora feels the need to get back at her worst enemy, but doesn't feel like leaving the house, she just pulls out this doll and has some fun terrorizing it. I guess it would be best not to let Jhudora have a plushie in the shape of your pet then, hmm. Blueberry Urgoni Cupcake: Mmmm, doesn't this muffin just look so cute, and oh-so delicious! Who couldn't resist blueberry muffins with a cutie face on it... Well, that is until you bite into it and the spikes give you a nasty surprise! Jhudora uses this cake specially for her favourite guests. Mmm, what's this lovely cupcake I've just been given. -eats- OWWW. You might want to avoid the tables with all the muffins, eh? Burst Blue Bouncy Ball: Have you ever been given a present, and been eager to open it and see the nice surprise which is hiding inside? What if you got past the wrapping, only to find a punctured bouncy ball? You have probably had this happen to you already, though, if Jhudora has ever handed you a gift. She has a great way with the little kids, always seeming to make them cry. Darkest Faerie Plushie: Yes, we all go to bed with a cute little teddy by our side to keep us safe over the night, but do we go to bed with the Darkest Faerie Plushie? Every night before Jhudora sleeps, she plans what evil deeds she must do in the days to follow, telling all her deepest darkest secrets to her plushie. Just imagine what crazy things would happen if the faerie plushie gained magical powers through Jhudora's magic... Watch out, Neopia, stay safe and away from these scary plushies. Jhudora's Harp: Jhudora loves to make a lovely tune throughout Faerieland... Or maybe not so lovely, with this harp of hers. It tends to let off quite the opposite to lovely, in fact. Because she has such fun stomping around the land annoying everyone she can set her sights on, this harp does wonders for her. Everyone could be fast asleep, then suddenly evil and unpleasant sounds make their ways through to the sleeping Neopians' ears. Maybe you can join Jhudora's league and trump around with one yourself. Cover of Darkness Foreground: This is the very item that our lovely Jhudora employs when it comes to making a menacing entrance to the people that oppose her. I mean, after all, Jhudora can't orchestrate her evil and malicious plans that she has been meticulously brewing on Jhudora Day without first working on those special effects (well, she isn't that powerful after all). Just be careful not to inhale any of that smoke, especially on Jhudora Day. 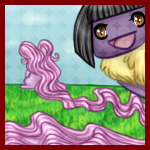 Dark Faerie Sister Wig: Jhudora definitely is pleased if her followers/fanatics, especially the avid customizers, get their pets to dress up like her on a special occasion like Jhudora Day. This wig (coincidentally inspired by the dark faerie sister Vanity) is a definite must as it is both stylish and gives off a malicious look to your pet. Perhaps Jhudora might spare you from her using her magical powers to turn all her foes into toads, because we just know Jhudora isn't that cruel, right? Jhudoras Exploding Muffins: We all know Jhudora likes to end her evil plans with a big bang, but this is ridiculous. Just be careful and better check your basket of muffins to ensure they aren't the exploding kind, because Jhudora is not only known to be evil but also to be mischievous since she occasionally pranks her foes especially her dear arch-nemesis Illusen. So never trust Jhudora whenever she feels the need to be very generous and hands you some muffins, especially on Jhudora Day; chances are she has explosive intentions up her sleeve. Bartamus: This expensive cute but surly petpet can only be obtained by completing one of Jhudora's dark quests. Similar to how Sophie the Swamp Witch has her personal familiar Meowclops, as we all know witches need a petpet of some sort to act as a familiar (well, witches with magical powers only), a Bartamus shares a common characteristic with the lovely Jhudora. They are both grumpy and fierce and they are very aggressively quick to attack their opponents should they be angered. Therefore this grumpy petpet makes a perfect match with Jhudora. So as we conclude this article, you would now have a better and clearer understanding on what our lovely Jhudora likes. So play around with them (please our powerful dark faerie idol) and Happy Jhudora Day, everyone. "Jhudora, hurry up! You don't want to be late!" my mother called out from the hallway. "I'll be right down, Mom!" I replied with great excitement. "I'm putting out some petpet treats for Barty!" I get to see Jules this morning. We've arranged a breakfast on the bank of a river. I asked that this be done, and surprisingly my wish was granted.